in late fall and early winter. Who among us hasn’t made a New Years resolution? Mostly we resolve about the less important things in life, like cutting back on our overeating, excessive drinking and smoking habits. Unfortunately, the real important resolutions -- the need to fish and to fish more often -- get put on the back burner. This year address the important issues in your life and make a resolution to spend more time on the water and also to zero in on that preverbal “Fish City” where the big ones are as common as mosquito bites in June. In all seriousness, winter is the perfect opportunity to start the process of planning a fishing trip and investing in the gear it will require to be successful. Winter is also the perfect time to recruit some buddies who also enjoy fishing. A group of anglers splitting expenses including fuel, lodging, food and other costs can enjoy a world class fishing trip for surprisingly little money. Picking the destinations the Fishing 411 TV crew visits is my responsibility and it’s a responsibility I take seriously. From day one the goal of Fishing 411 has been to provide our viewers with the information, aka the “411 on fishing” others can use to duplicate the results showcased on TV. Finding “hot fisheries” and also recognizing the best times to visit them is a weeding out process. Frankly there are more quality places to fish in the Upper Great Lakes region than a man could visit in 10 lifetimes. The process starts by identifying a target species of interest and then using the internet to zero in a list of lakes, rivers and/or reservoirs that have a reputation for routinely producing these fish.The internet is also invaluable in helping to ferret out the fishing camps and or communities that service those fisheries. Some fishing destinations become known for their ability to cough up trophy class fish and others are better described as producing numbers of eating sized fish. 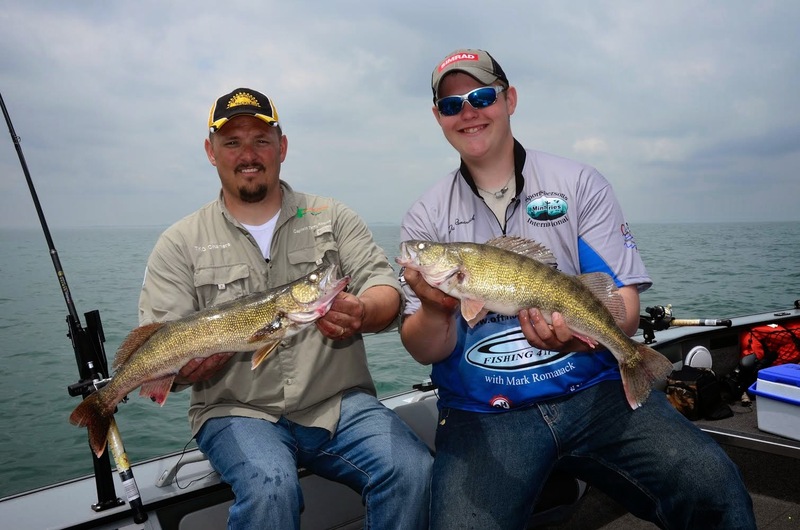 Walleye fisheries are a classic example of fishing destinations where it’s common to find fisheries that offer up lots of fish, but more rare to find ones that routinely produce trophy class fish. For example, the Bay of Quinte in eastern Ontario along the shores of Lake Ontario is a great place to visit if you’re after trophy sized walleye, but not the best option if you’re motivated by numbers and catching limits of eating sized fish.Early in the research process it’s important to make a conscious decision to target trophy waters or waters that produce numbers of fish. Using the world wide web as a research tool makes lots of sense, but I recommend using this resource with both a skeptical and trained eye. Fishermen as a whole tend to exaggerate their angling experiences and the internet seems to be a fertile place for these exaggerations to grow! Lodges, fly-in services, motel and bait shop owners are understandably a little biased in that they have a vested interest in attracting anglers to their slice of fishing Shangri-La. Determining what’s reality and what’s reality exaggerated by the internet is a skill the traveling angler needs to master. Photographs are one of the tools I use most often to accurately judge the quality and validity of a fishery. spring kings, coho, browns and steelhead. Images posted on web pages, social networking sites and other electronic sites doesn’t lie if you know what you’re looking at and how to accurately interpret the message these photos portray. Images more than any other source of information help me zero in on key bodies of water, species of interest, the best times of year to fish and often the most productive lures or presentations to use. When I look at photographs from a lodge or those offered up by and individual on a chat site or Facebook account, I’m interested in the relative size of the fish and how often posts of similar fish are being made. Any body of water can crank out the occasional trophy fish, but that doesn’t necessarily make that fishery a good destination. The trick is to find the fisheries that routinely produce quality fish. Sites that post lots of pics of adult fish and post them often get my attention. If the photographs posted have not been updated recently, I’m immediately suspicious that what I’m looking at may be a fishery that is in decline for one reason or another. If on the other had I start finding lots of recent photographic proof that fishing is good, I start digging a little deeper. At this point I use either Facebook or e-mail to make contact with an individual or individuals who can potentially share personal experiences with a particular fishery. My goal here is to pick as many brains as possible to determine the quality of the fishery, the best times to visit and also the presentations that seem to catch the most fish. Camp owners typically provide “references”, and these can be good resource people to visit with. Chat sites are also good places to put out a thread on a particular fishery or camp and see who replies and what information is willingly shared. If during this interview process I start hearing several unrelated sources saying the same things about the same fishery, I start to believe what I’m hearing. It’s this system of narrowing down the options that has served me well and put me on countless great fishing adventures over the years. It’s important to understand that most fisheries do not get red hot and stay that way over long periods of time. Most fisheries quietly improve over time until they reach a peak. Once the angling mainstream discovers a peaking fishery, angling pressure fairly quickly starts to take its toll. Over time, both the average size and number of fish taken from these select fisheries starts to decline. Certain species like slow growing lake, brown and brook trout are especially vulnerable to increases in angling pressure. Other delicate species like northern pike and musky also suffer when a fishery suddenly receives significant media attention and angling pressure. The natural peaks and valleys in a sport fishery occur for lots of reasons. Sometimes a fishery suffers because a stocking program is abandoned, other times bad weather at critical spawning times can devastate a fishery. In some cases introduction of one species become counter productive to another. The point is as a fisherman it’s important to know if a fishery is peaking or if that fishery has passed the peak. Facebook and Twitter have become two of my most often used researching tools because the information shared is timely. It seems everyone has a smart phone these days and pics on the social networking sites are being posted daily. Photos on web pages are rarely as current. Camp operators, guides and charter captains are busy people and often they don’t do a good job of posting fish pictures as the fish are caught. Instead these images get posted at the end of the season or during the winter. Finding Fish City isn’t easy, but a little research goes a long ways to insuring your next fishing trip is going to be one to remember. (#9 on our Dirty Dozen) a port just east of Sandusky. 1. Lake Erie walleye near Toledo Beach and Monroe. Fishing is best in late May and throughout June. Best presentations are crawler harnesses fished on Tadpole Divers or Jr. Streak Spoons fished on Lurk Rundown Divers. 2. Port Clinton, Ohio walleye. Fishing is best in late April and throughout May. Best fishing presentations are crawler harnesses fished on bottom bouncers and also on Tadpole Divers with in-line boards for suspending fish. 3. Saginaw Bay, Au Gres, Michigan walleye. Fishing is best in late April through June. Best presentations include bottom bouncers with crawler harnesses, Tadpole Divers with harnesses and Jr. Streak Spoons fished behind floating Rundown Divers. Divers are best fished on in-line boards. 4. St. Joe Michigan, mixed bag coho, kings, browns and steelhead. The best fishing is in late April and early May 50 feet of water or less. The best presentations are trolling Mini and Standard Streak Spoons fished on divers, downriggers and 3 to 5 colors of lead core line fished in combination with in-line boards. 5. Detroit River walleye. Best times to fish are mid to late April. Best presentations are 1/2 to 5/8 ounce jigs tipped with minnows or soft plastics. Fish near Cobo Hall, the Post Office, the tip of Mud Island and the Steel Mill. 6. Harbor Beach, Michigan steelhead, coho, browns, lakers and kings. Fish in late April through May. Best presentations are trolling with Mini and Standard Streak spoons fished on downriggers, Tadpole Divers and lead core for silver fish and dodgers with Spin-n-Glos for lake trout on bottom. 7. Oscoda, Michigan steelhead, atlantic salmon, king salmon and walleye. Fish in July and August in 80 to 120 FOW. The best presentations are trolling Mini and Standard Streak spoons on downriggers and 5 to 10 colors of lead core for silver fish and Jr. Streak Spoons on 5 to 10 colors of lead core for suspended walleye. Dodger and Spin-n-Glo combinations are tops for lake trout. 8. Frankfort, Michigan mixed bag lake trout, king and coho salmon. 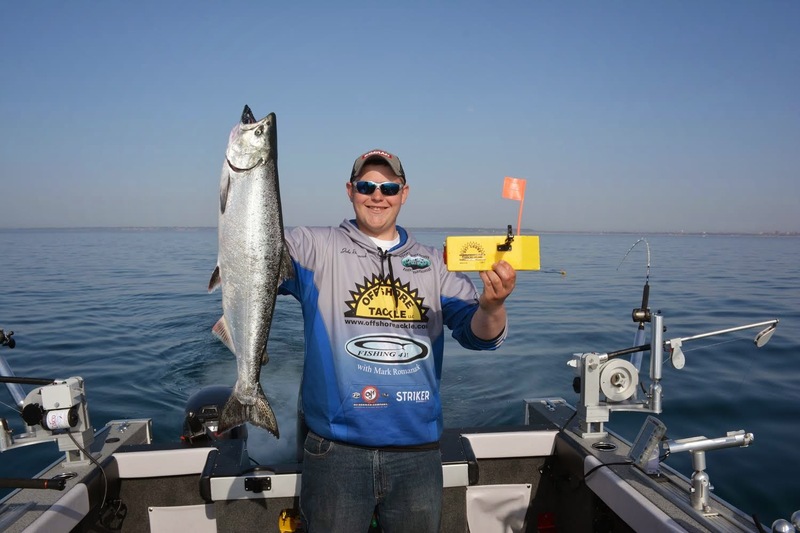 Fish in July for lake trout on bottom along the break near Betsie Point using trash can dodgers and Spin-n-Glos and also lake trolls with Spin-n-Glos. Kings and cohos come later in July and throughout August trolling standard Streak spoons on 5 to 10 colors of lead core, magnum divers also with spoons. 9. 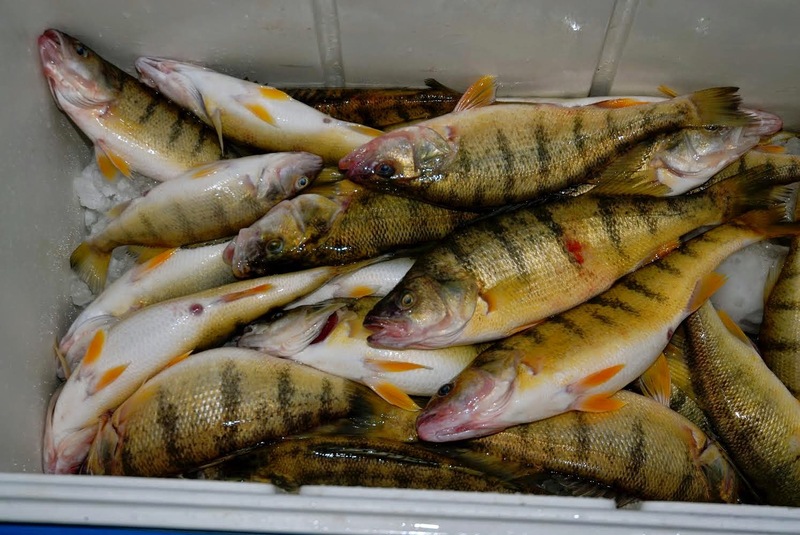 Huron, Ohio yellow perch. The best times to fish are August, September and October. Fish straight out and to the east of Cranberry Creek Marina in 30-40 FOW with perch rigs and minnows. Average perch is 9 to 10 inches with jumbos common. 10. Lake Nipigon Brook Trout. Fish in late May and the month of June. Casting the main shorelines and around islands using Rooster Tail Spinners tipped with chunks of Gulp or Powerbait. The average fish is 20-23 inches long! offers great action in late fall to first ice. 11. 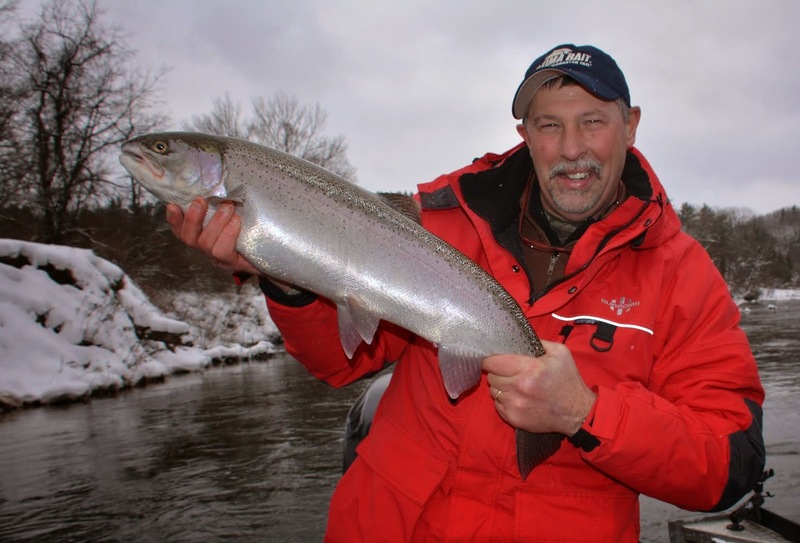 Big Manistee River steelhead. Fish in late October, November, December and during warming trends in January or February. Roll bottom with spawn bags early in the fall and switch to Yakima Maxi Jigs tipped with wax worms fished on floats when the water temperature drops below 40 degrees. 12. Port Clinton, Ohio trophy walleye, Late fall fishing from Halloween until the ice forms in December gives Port Clinton a 2nd listing on the dirty dozen. Trolling Reef Runner 800 series crankbaits and also No. 12 Deep Rapala Husky Jerk crankbaits on Off Shore Boards. Trolling speed 1.2 to 1.5 MPH. For more specific details on these hot fisheries and other great fishing destinations, follow and like the Fishing 411 Facebook page. Frequent posts are made that help anglers zero in on quality fishing destinations and the best ways to catch those fish.